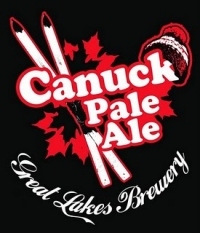 TORONTO, ON – Great Lakes Brewery have announced that their previously planned Coastal Pale Ale will now be released as Canuck Pale Ale. A west coast style pale ale, Canuck will soon be available on tap at several bars in Toronto and area, with a limited number of 650 ml bottles to follow in early February. The bottles will be available in at selected LCBO outlets as well as at the brewery store. Canuck Pale Ale will also be served alongside an assortment of other Ontario craft brews in the Ontario Pavilion at next month’s Winter Olympic Games in Vancouver.